It seems that everyone's jumping on the voice-controlled home assistant bandwagon. Alexa vs Google Home: it's time to decide which one is right for you. If you're visiting someone at their home, you might hear them shout a command into the air to dim the lights or change the song on the sound system. More often than not, whichever command is being yelled into the ether will be preceded by the word ‘Alexa' or ‘Google'. Alexa is the virtual assistant you will become all too familiar with if you have Amazon Echo. Google offers Google Home. But which of these is the better smart speaker? What are the differences between the two? Which one has perks that the other doesn't include? One of the major factors in both of these products is the voice assistant function they each offer. Off the bat, both devices include far-field microphones, and so are equally effective at picking up your commands without having to stand over the mic and shout. In terms of the Alexa vs Google Home debate, Alexa's default search engine is Bing. This might automatically scare some people off, as Bing is used less than Google. Alexa understands simple commands, but they tend to need to be simple and basic. You need to phrase things specifically in order for Alexa to grasp what you're saying. This is something you will get used to, so it's not the end of the world. But in essence, it's an unnatural way to speak. Alexa's activation phrase is, indeed, Alexa. You can opt for one of three alternatives – Amazon, Echo, or Computer. The issue with all of these is that they can be easily mistaken for other words used in day-to-day life. If a member of your family is called Alexa, then the game's up. It's fairly safe to assume that no-one in the house is called Google, and few other words can be confused for this very distinct phrase. While the terms Amazon, Echo, and Computer are often used in general chat, Google is only referred to when you want to use it as a facility. Google Home will also tie in with your overall Google usage, which will be across all devices. If you ask it to create a list or a reminder, it will sync this to your Google account and/or your phone. 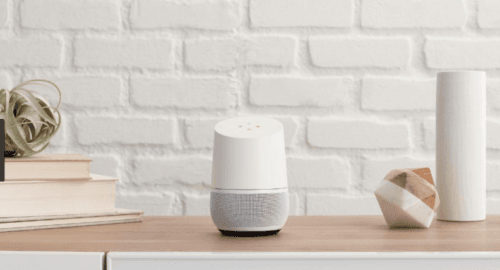 Google Home's wake up phrase is… Google Home. Having a two-word phrase means it's less likely to wake up the device if you're simply talking about how you googled species of seahorse the other day. Another perk is that Google has a natural language processing algorithm. Thus, you can be more conversational with it. If you asked Google Home ‘Are there tickets available for Star Wars tomorrow at the local movie theatre?' it will answer you. If you then asked ‘And the day after?' it will know that you're on the same strand of questioning. The fact that Google Home ties in with Google Maps is another advantage. Traffic reports or navigational advice is better than with Alexa, which requires you to enter a particular address into the Alexa app for traffic information. Alexa can, however, take information from a paid-for G Suite Google Calendar. Oddly, Google Home cannot do that (yet). But this doesn't mean the Alexa vs Google Home debate is over. The app store that is connected to Alexa also offers up so-called ‘Skills' that you can add on to the device. This is something Google Home doesn't let you expand upon. The scope for additional features is better with Alexa. Both products allow multiple users, so they're re equally useful to households with more than just one inhabitant. Whether you like watching webinars, listening to podcasts, or browsing YouTube, both Alexa vs Google Home allow you to do this just by asking them to. But which one is the most effective when it comes to getting your video on screen or your music on the speakers? Being that Alexa is an Amazon product, it streams from Amazon Prime Music. The same reasoning goes with Google Home. It will play music and other content from Google Cast and Play Music. In addition, for those with Spotify accounts and TuneIn radio, both feature these too. Google also offers Pandora (U.S. only). When it comes to Alexa vs Google Home, they are actually both very similar in what their capabilities are with this kind of content streaming. Each smart speaker allows you to create streaming groups. Plus, you can access them across more than just the one device. This means you can use them as a multi-room audio tool. The common issue with both of these smart speakers is that the control is more complex than a device that is just dedicated to the playback of music. Google Home offers something called Cast support which lets you send video to a Google Chromecast. This might be Netflix or YouTube. It also allows you to take charge of playback via vocal commands. Cast support is also compatible with speakers. Therefore, you can use it via voice control in conjunction with other supported devices. Alexa, however, can be linked up to a Fire TV or Fire Stick, so you have similar video playback options as with Google Home. The downside: there are not the same capabilities for playing music. As you see, so far there's no clear winner in the Alexa vs Google Home war. These devices are going to be part of the way your home is furnished. So, how do you want them to physically fit in with the design of your home? With Alexa vs Google Home, Google Home has come out on top when it comes to attractiveness. However, Alexa's newer versions are a lot prettier. Alexa now comes in a selection of six different designs. Three of these are material, two are wood, and there is a sixth with a metallic finish. You can, therefore, buy an Alexa device to specifically fit in with your decor. This doesn't mean Google Home is ugly. It was always the consensus that Google Home had a sleeker design anyway, with its curved shape that has been linked to glassware or candles by its developers. It also offers the option to replace the bottom casing to match your interiors. There are six to choose from, and they come in a variety of materials. One is even a fabric design. Google Home also offers four LED features. Alexa also offers physical on-device controls in case the voice commands aren't cutting the mustard for whatever reason. You can activate it, alter the volume level, or mute Alexa altogether using the physical controls. This product also offers the option to purchase additional accessories, such as more speakers, to kit out your overall home system. You can use Bluetooth or an audio jack to hook it up to speakers that have more of an impact when it comes to broadcasting sound. Google Home offers a touch panel and a mute button. The touch panel is, arguably, more fiddly. You can use each device to control your home's thermostat temperature levels. Users can also switch on or off (of dim) lights via vocal control. It's crucial to check first which of the devices actually support the smart home system you're looking to sync it up with. If you're upgrading your home with a smart speaker and a smart home system all at once, you can tailor this. But if you have an existing smart home system, make sure it works with the home assistant you want to invest in. 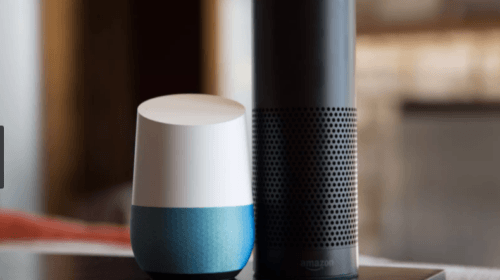 In terms of Alexa vs Google Home, Alexa has undergone upgrades recently in on its accompanying app, making it a little better than its competitor when it comes to smart home use. You can now control some of the smart home devices you have via the app. You can turn on lights, for example. This means you have remote access, and that you're able to give the impression you're at home 24/7. This functionality isn't applicable to everything. Thermostat temperature, for instance, can't be set via the app. The way smart home devices are listed on the app has been criticised too. They are collated alphabetically rather than allowing you to organize them into your own user-friendly system (such as ‘Most Used' at the top of the list). Alexa's ‘Routines' feature is very impressive. It allows you to command multiple devices with one single word or phrase. Saying to it ‘Alexa, goodbye' could be your phrase for switching off the lights, turning off the heating, and putting a halt to the music. This means you can do this as you leave the house – all by saying two words.In the category of Alexa vs Google Home's smart home compatibility, Alexa wins. Both systems have features for making calls, either in your own home or outside using the Internet. Alexa offers the Echo Show, which is a video call function. It also has a function called Drop In. This lets you listen to another Echo. You can chat briefly with another Alexa user or communicate with another room in the house. These options, however, can be seen as a negative. Many think it's too intrusive, so the option to block this feature or switch it off is available to users. Google Home offers a feature called ‘Broadcast'. You can record a message and send it via Google Home to all of the speakers around the house. There are also functions available (or in development) where your Alexa device or Google Home can call phone numbers. Without a doubt, the Alexa vs Google Home debate is at a tie. Which Smart Speaker Is Right for you? It's undeniable: both of these devices are revolutionizing communication around the home. Whether it's inter-household communication or external, the functions are fast changing the shape of 21st-century living. When making the decision of Alexa vs Google Home, think about which one you would prefer to live with. And what are you using it for? If you're looking for a personal assistant, Google Home might be the better choice for you. It's perhaps less stilted when it comes to talking to it. It also looks a little less industrial. Plus, the Google Cast feature is perfect when it comes to syncing it up to Chromecast or Cast-enabled speakers. Alexa's range of accessory speakers, however, are more complex. The Echo Show is an excellent accessory. Alexa can be more frustrating to talk to. The Skills that can be added allow Alexa the potential to do more than Google Home. This includes its vaster options for syncing it up to a smart home system. Have you purchased these smart speaker devices and tried them out? What do you think of them? Have you any pros and cons you'd like to add to the Alexa vs Google Home debate? Let us know in the comments. Don't forget to check out our blog for more technology tips!